A large and imposing piece of furniture designed to make the sitter feel really important but also comfortable. This chair demands to be viewed from all angles. 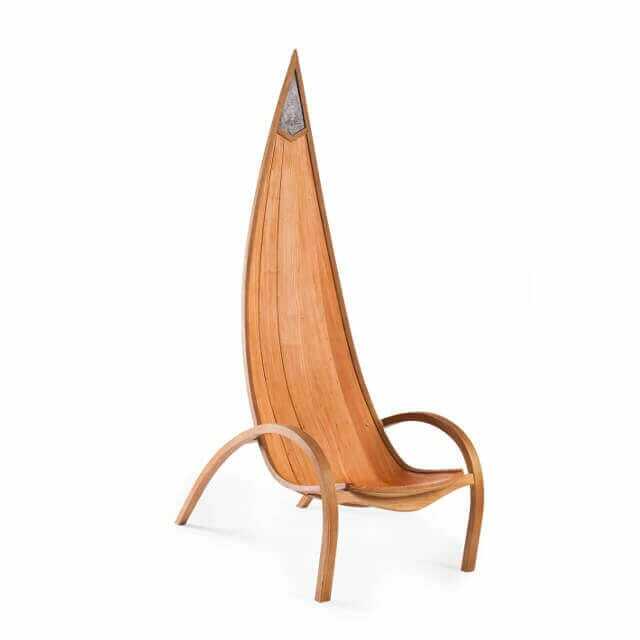 Made of steamed and laminated oak and larch using traditional wooden boat building methods, it is intended for use outdoors but is equally at ease as an indoor throne. It is finished using natural oils. This chair is intended as a major statement piece of furniture. 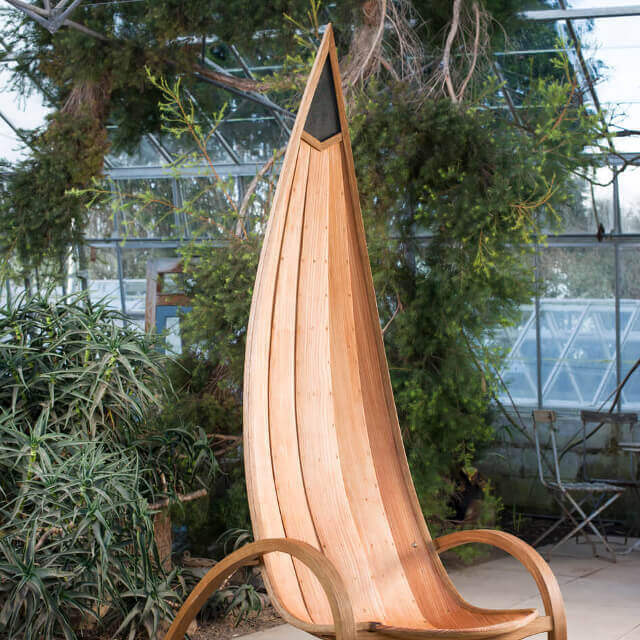 It was the first and is the most literal of the clinker boat influenced chairs in my range and resembles a Viking longship, hence the name, Norse. 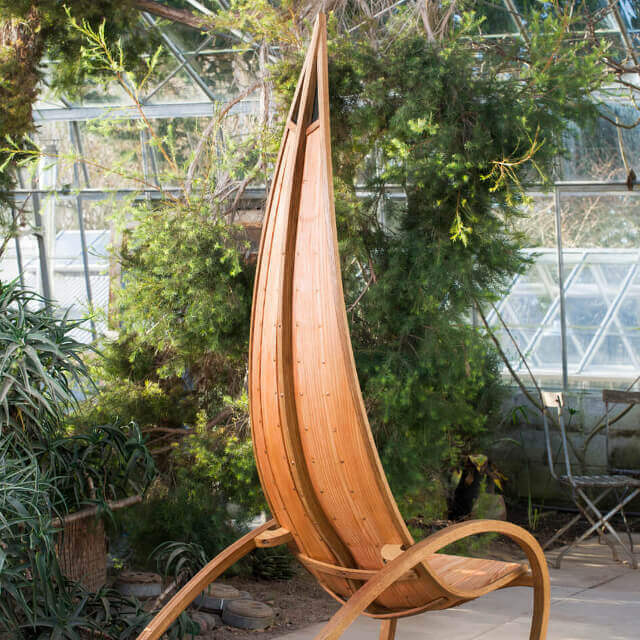 The chair is built using methods & materials proven in the marine environment. Aged 23, I bought an old wooden Norfolk Broads cruiser to live on. It immediately became apparent that it was falling apart and that my wood working skills were utterly inadequate to stop the rot, so I embarked upon a woodworking course. I never did get to grips with that boat, but woodwork got a grip on me. I diverted off to making and studying furniture, graduating from De Montfort University, Leicester, with a degree in furniture design. The lure of wooden boats, however, was persistent, so in 2005 I moved with my family to Cornwall to concentrate fully on boat building. We bought another huge wooden boat to live on, this time with sufficient knowledge and kit to knock it into shape and make a comfortable home. I also got some good commissions to build boats. While working on a small wooden boat, the idea of of making furniture using traditional wooden boat building materials and methods occurred to me. As neither boats nor furniture would leave me in peace it seemed obvious to combine the two. These are the results. All of my work is directly inspired by wooden boat building methods. I soon learnt that what makes wooden boats pretty are fair curves. These curves are achieved through using very long batons and a calibrated eye. 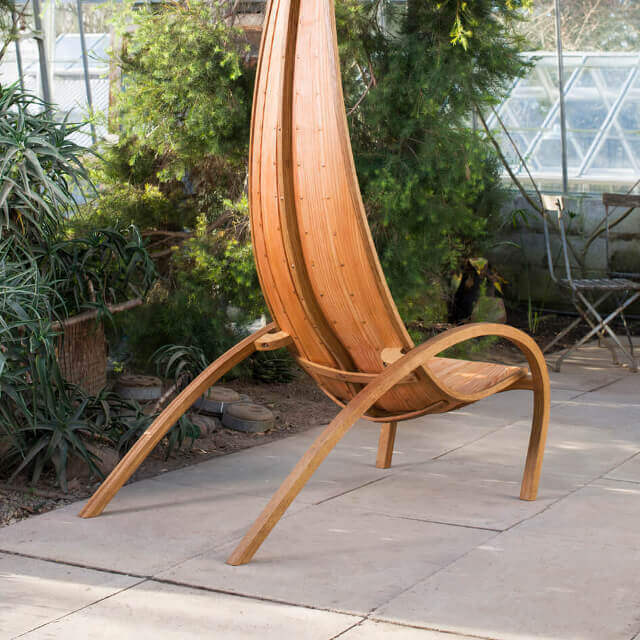 The curves on my chairs are all derived from using boat building methods and experience. 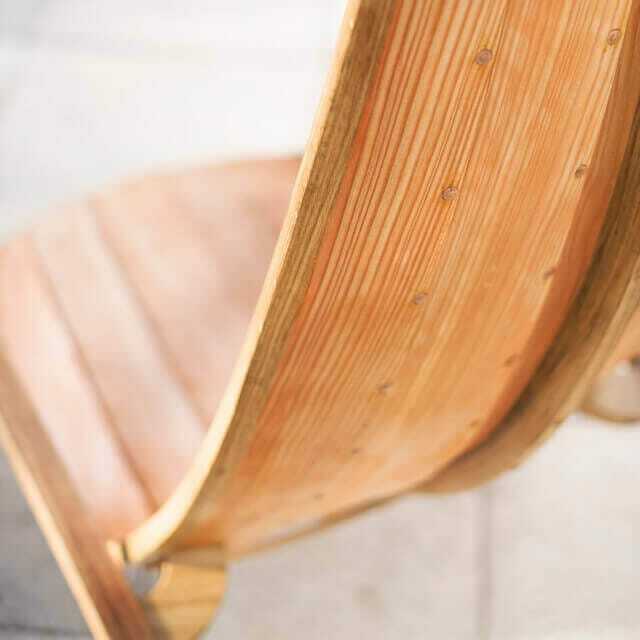 As my chairs are intended for use outdoors, using materials and methods proven in the marine environment does help to inspire confidence in the buyers. I am also a big fan of the mid 20th century Scandinavian furniture designers which will probably surprise no one. This collection of work could not have materialised without this blend of experience and education in both furniture and boats. As a consequence I believe them to be quite unique.